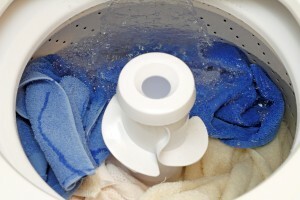 Using non detergent laundry soap isn’t the only way to get clothes clean in a manner that’s better for your family’s health and the environment. CleanStart®, from RainSoft, is an eco-friendly home laundry solution that greatly reduces and often eliminates the need for laundry soap, bleach, fabric softener, and other products that commonly contain an alarming amount of hazardous chemicals. Though designed for household use, CleanStart® utilizes the same technology that can be found in an ever-increasing number of commercial laundry operations. Instead of soap, it uses Activated Oxygen, which is one of nature’s safest, strongest oxidants and a highly effective disinfecting agent. Using just Activated Oxygen and cold water, CleanStart® produces incredibly clean clothing without introducing thousands of gallons of soapy water and toxic bleach into the environment. It is an environmentally responsible product that is built to provide many years of reliable service. Energy savings – Because only cold water is required, you won’t have to consume large amounts of energy just for the sake of doing laundry. Longer lasting clothing – Though effective, today’s best-selling laundry detergent brands eventually take their toll on clothing. Not so with CleanStart®, which extends clothing life by not using any harsh chemicals whatsoever. No skin irritation – Have any infants or small children? CleanStart® eliminates skin irritation that some children can experience after wearing clothing that’s been laundered with off-the-shelf detergent. Money savings – The average savings for a family of four that uses CleanStart® over a 10-year period is about $6,500. For more information about why CleanStart® is such an effective alternative to non detergent laundry soap, contact your local authorized RainSoft dealer. CleanStart® is compatible with all washing machine styles and is backed by an industry-leading Limited Lifetime Warranty.